The Book of Joy is based on a captivating and moving conversation between two of the most prominent spiritual leaders of our time -- the Dalai Lama and Archbishop Desmond Tutu. In an engaging and often humorous encounter, the two discuss the challenges of living a joyful life in the face of life's inevitable suffering. Both the Dalai Lama and the Archbishop have faced incredible hardships in their lives and yet their compassion and ability to truly forgive are boundless. In our study circle, participants will be encouraged to lead the discussion for a chapter of their choosing. We will meditate using the Joy Practices contained in the last section of the book. Participants are invited to write a short essay at the end of the study circle to reflect on what they've learned. Venerable Tendrol studied Buddhism with Dr. Jan Willis at Wesleyan University in the 1980s. 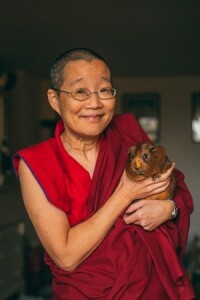 She lived in Madison, WI, and attended teachings given by Geshe Lhundup Sopa and Jangtse Choje Rinpoche Losang Tenzin at Deer Park. In 2004, she received the certificate of completion for FPMT's Foundation of Buddhist Thought program. In 2008, she had the good fortune to receive novice ordination vows from Gyumed Khensur Rinpoche Lobsang Jampa. In 2017, she received the certificate of completion for the FPMT Masters Program (home study). The Book of Joy: Lasting Happiness in a Changing World (Douglas Abrams editor, the Dalai Lama, Archbishop Desmond Tutu. Avery. 2016).